Fusarium wilt causes leaves on one branch or one side of the plant to turn yellow. Eventually the entire plant can be affected. This is the time of year that tomato plants are bountifully producing fruit-- or sometimes not! 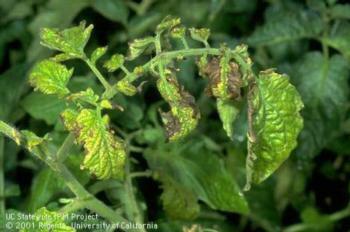 Wilt diseases of tomato can dramatically reduce that harvest and sometimes outright kill plants. 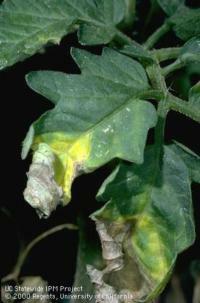 Fusarium wilt of tomato is caused by the fungus Fusarium oxysporum f. sp. lycopersici. This soil inhabiting fungus only infects tomato. It exists as three types (races) and fortunately many tomato varieties are resistant to the most common one. Disease is accelerated by warm soil. Verticillium wilt of tomato is caused by the fungus Verticillium dahliae. This fungus has a relatively wide host range capable of infecting many garden vegetables and ornamental plants. Fortunately many tomato varieties are resistant to this fungus too. Disease is favored by cool soil and air temperatures. Verticillium wilt on tomato. Plants with Verticillium wilt develop a patchy light brown discoloration in the xylem tissue (left). Even in the absence of a susceptible plant, both Fusarium and Verticillium form resistant structures that can survive in the soil for many years. They are spread when infested soil is moved on tools or shoes and sometimes in seed and transplants. In the presence of a susceptible plant, the resistant fungal structures germinate and penetrate the plant's roots either directly or through wounds. Once inside the root, the fungus grows until it reaches the water-conducting cells (xylem) and then spreads upward through the plant. 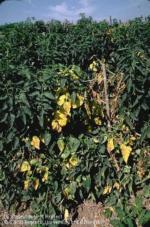 Water flow in the plant becomes restricted and leaves begin to wilt, turn yellow and eventually die. These symptoms often begin on one side or branch of the tomato plant and can eventually spread to other parts of the plant. It is often difficult to distinguish the difference between Fusarium and Verticillium wilts by symptoms alone. To be sure of the diagnosis, the symptomatic portions of the plants can be sent to a plant pathology laboratory where cultures can be made and identification can be verified. Fusarium wilt on tomato. As with Verticillium wilt, yellowing and necrosis are often the first symptoms expressed on the leaves. It is important to avoid disease in the first place by planting suitable tomato varieties that are resistant to wilt diseases. Look at plant labels for variety names followed by a “V” (Verticillium wilt) or “F” (Fusarium wilt) that indicate resistance to the corresponding wilt disease. Examples of these varieties are ‘Better Boy’ (VF), or ‘Better Bush’ (VFN). Note that you might see additional letters following the variety name. For example, VFN indicates that the variety also has nematode resistance (that is the “N”). Resistance does not necessarily mean that the variety will be free of disease. Especially in situations where these diseases have occurred in the past, even disease-resistant varieties may encounter some difficulty attaining full growth and production potential. For this reason, it is generally recommended that crops are rotated to avoid planting tomatoes or other members in the tomato family (Solanaceae) for at least 2 years. If suitable, corn could be a good alternate crop for soil infested with Verticillium. Verticillium wilt on tomato. The first symptoms expressed are often yellowing between the leaf veins followed by necrosis. Reusing garden plots and soil that have had wilt diseases can be problematic. Diseased plants and roots should be completely and carefully removed from the soil. Diseased portions should be bagged so that clinging soil and infected plant parts are not inadvertently moved and dropped in other parts of the garden. Sanitation of infested soil is often difficult and takes time. Soil solarization in coastal climates with a clear plastic tarp may not completely sanitize the soil because the sanitizing heat does not reach deeply enough in the soil to kill the wilt pathogens. Solarization in hot climates usually takes 30 days or more to increase soil temperatures to effective sanitizing temperatures at soil depths where roots will eventually grow. Solarization can be enhanced with biofumigation. Products containing naturally occurring isothiocyanates (broccoli, cabbage, mustard seed meal) are mixed in the soil before the soil is covered with a clear plastic tarp. Fumigant-like chemicals are released that are toxic to pathogens, insects, nematodes and weeds. Gardeners sometime grow plants in new soil that has been deeply mounded over the infested areas or use potted plants in these areas. Beware if roots grow down or out the bottom of pots into the infested soil. These simple methods are best suited for shallow rooted and short-lived vegetable crops or ornamental annuals. A layer of plastic or other separation might be needed to keep roots in the mounded soil and out of infested soil below. Potted plants could be supported on old wooden crates over infested soil. 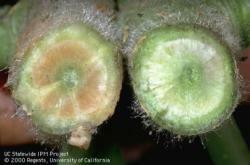 For more information, see UC IPM pest notes for Fusarium and Verticillium wilts.